There exists a prototype of Arthur Conan Doyle’s "Lost world" – Caparu Meseta in Bolivia. 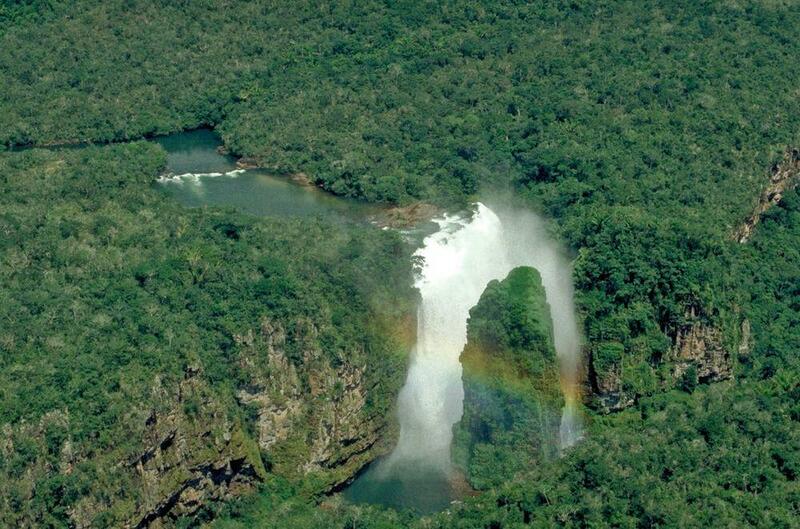 The most beautiful location in this fantastic place is an enormous waterfall – Arcoiris Falls. Arcoiris Catarata (Rainbow Falls in Spanish) is a very special waterfall – at a certain moment in the afternoon it is adorned with a bright rainbow above the falls – hence the name of falls. This waterfall is located in a dramatic ravine of Rio Paucerna – one of the largest streams on the enormous Caparu tableland. The 88 m tall Arcoiris Falls are the first major falls at the rim of plateau – 6 km further down the stream are the spectacular 25 – 45 m tall Frederico Ahlfeld Falls. Much closer – just in the opposite side of the valley along the steep cliffside is sliding another waterfall – Cola de Caballo. 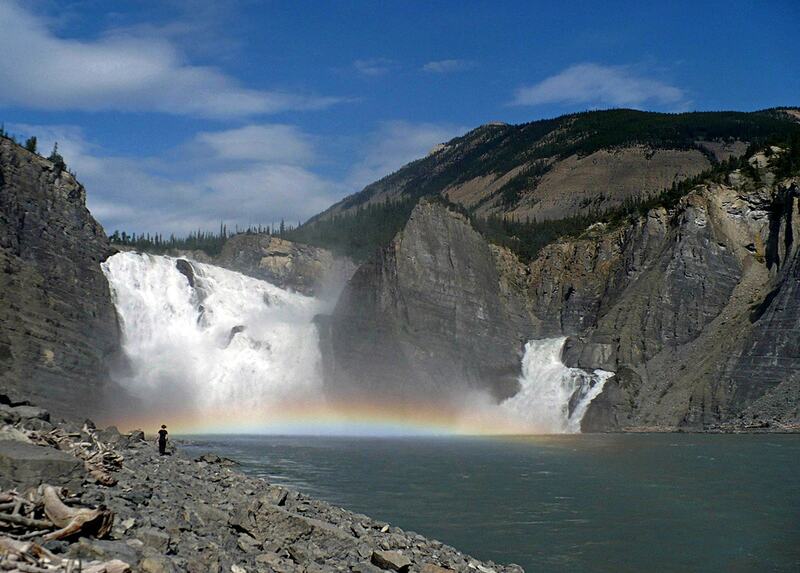 Arcoiris falls are located in a jagged, jungle covered ravine, which makes here several sharp turns. In the dry season of the year there is less water in falls and becomes visible another phenomenon – the water is falling over countless smaller steps of quartzite. Caparu Meseta (Caparuh Meseta, Ricardo Franco Hills, Serrania de Huanchaca, Huanchaca Plateau) is an unique tableland. For most part it is delimited with vertical cliff walls, which are up to 300 m high. This plateau is some 155 km long in north – south direction and up to 55 km wide, area is approximately 3,000 km². It consists of Pre-Cambrian sandstone and quartzite rocks, which are more than 1,000 million years old. Meseta has extremely high biological diversity. On the plateau have developed several kinds of rare ecosystems, including a unique dry forest – the largest virgin Cerrado forest in the world. The legendary explorer Percy Fawcett most likely was the first European who reached this tableland in 1908. He was very impressed by the sight of this flat topped plateau rising high above the jungle. These jagged walls continued for many kilometres. Fawcett and his team ascended the plateau and were wandering on the northern part of it, experiencing many unusual events. The story of Fawcett in Royal Geographic Society in 1911 left an impression on one of listeners – Sir Arthur Conan Doyle. He was inspired to create the novel "The Lost World" (1912) about an expedition to a similar plateau and discovery of living dinosaurs and other amazing creatures there. Later this inspiration has been erroneously attributed to another location in South America – the magnificent Mount Roraima, but Fawcett has not been travelling there. One more legendary personality linked to this beautiful place is Doctor Noel Kempff Mercado (1924 – 1986) – the pioneer of nature conservation movement in Bolivia. He – an outstanding researcher and environmental activist – arrived with collegues Juan Cochamanidis, Vicente Castelló and Franklin Browne on Caparu Meseta in September 1986, and occasionally landed on an airstrip of a cocaine factory "Huanchaca" and they were killed (Vicente Castelló escaped). They planned to visit the falls during this expedition. This event shocked the society of Bolivia and more active fight against drug cartels started, although the case was not solved. 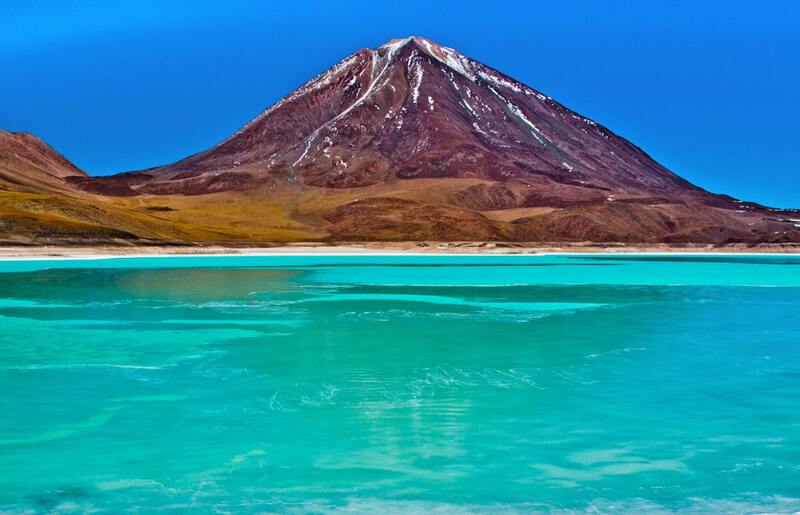 National park was established in this area in 1979 and initially it was named – Parque Nacional Huancacha. Park was renamed in 1988 to commemorate the deceased Dr. Mercado. This unique natural monument became a World Heritage site in 2000. The area of national park currently is 1 583 810 ha. Park can be entered only from two locations and entrance here is restricted. Trip to waterfalls takes much time and effort and often tourists prefer to pay more for airplane trip. 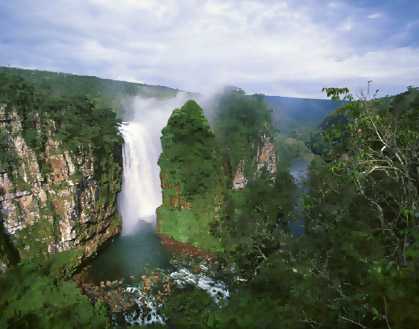 Tourists can visit the falls in the dry season of the year – in November – May.